UFV is getting even greener from Nov 20–24. Temperatures will be lowered slightly, and by doing so, we will be reducing our organizational carbon footprint. Stay comfortable while you work and study by dressing in layers. Dressing in layers can regulate temperatures as effectively as burning more natural gas in the heating system. UFV’s primary heating source is natural gas-fired boilers. Burning natural gas emits carbon emissions. Small changes can make a big impact: Subtle lifestyle changes, when multiplied, can have a significant impact on the reduction of carbon emissions. Participate in Sweater Week! 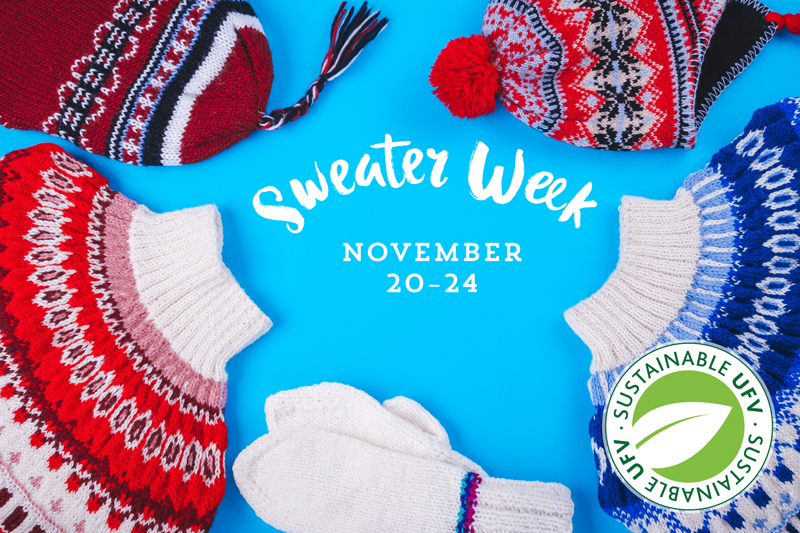 Help us spread the word with your sweater selfie’s and be entered to win prizes!